Q: What is Vectra (Dinotefuran + Pyriproxyfen) for Cats and Kittens? Flea infestation and protection from disease transmission to kitten or cats. Kills fleas within 6 hours. Kills on contact; fleas do not have to bite to die. Protects against flea-borne diseases including tularemia, rickettsiosis, bartonellosis and tapeworm. 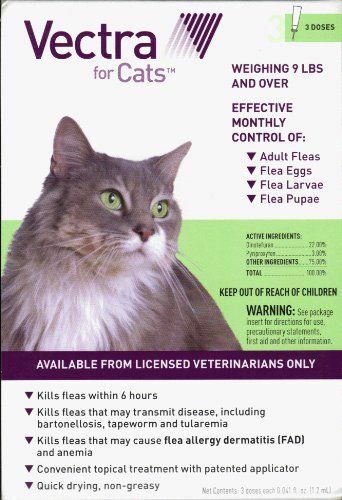 Protects cats from all stages of fleas: eggs, larvae, pupae and adults. One application protects your cat for 1 month. Contains an insect growth regulator. Protection for kittens as young as 8 weeks of age. Contact Elm Point Animal Hospital today to order or to consult with one of the doctors regarding your pet and Vectra!